I thought I’d expand somewhat on the Node-Based Megadungeon Design I started yesterday. I’d said the same processes and techniques are usable at multiple levels and that the nodes shown on the previous diagram can be expanded in a similar manner. Time for me to show that. 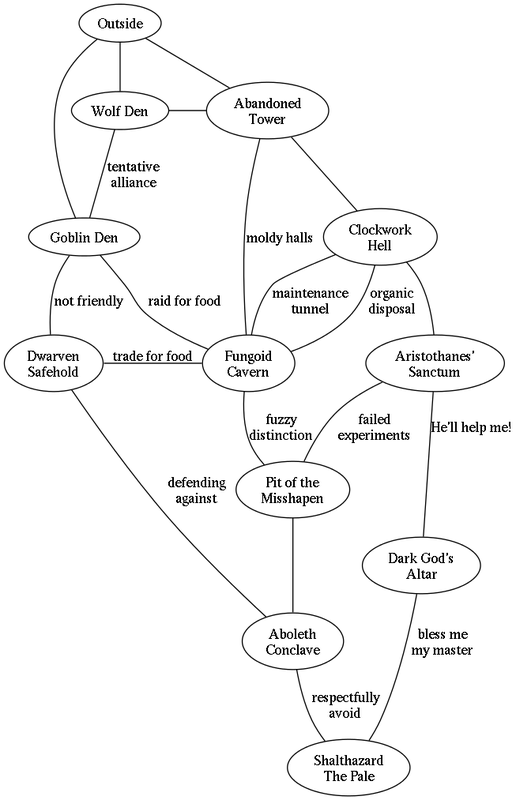 I will point out that the initial megadungeon design (node graph) was just that. As I flesh out the individual nodes I have found that there are places the edges (links between nodes) should be changed. I most add new ones, but there may be some others removed. … vocabulary could be a challenge, since I’ve got ‘node’ as a legitimate term at multiple layers in this exercise. This is what happens when things go fractal, I suppose. Anyway, each node in the maps expanding the high-level nodes identifies a region of interest. ‘White nodes’ are specific to the region, the shaded nodes actually indicate the nodes in the megadungeon graph. Abandoned Tower: Abandoned, broken-down wizard’s tower. Aristothanes’ Sanctum [Mad Wizard’s Sanctum]: Sanctum of an eccentric wizard who wants to know “how everything works”, and is prepared to disassemble anything needed to figure this out. Fane of Baalshamoth [Dark God’s Altar]: Alien source of knowledge, though the price is often misunderstood.